Several years ago I met an author. Max Lucado. No, I didn’t shake his hand…and I really didn’t meet him face to face…but I met him through the pages of his books. I do not have him on a pedestal . . . that is wrong to do. But I have found great comfort and reality in the words he writes. He writes with such clarity…that even I can understand. I have found great joy in giving. So, I want to share some Easter joy with someone. I will be having a give-away on Monday, March 24. All three hardback books will go to someone….special! Maybe it is you! Simply leave me a comment that you would like to be entered, and post about the give-away…and enter you I will! Also, on the Sisters of Faith blog, my sister, Aimee, and I are having a T-Shirt give-away! Time is running out on that one! So hope over there…and enter that one too! Wouldn’t it be a hoot if you won both give-aways? Update…Entries have closed! Thank you all for participating….check back this afternoon for the winner! (Name will be up by 3:00 p.m. CST) The T-Shirt winner on Sisters of Faith was “Darnelle”! Congratulations Darnelle! This entry was posted on Sunday, March 23rd, 2008 at 1:51 pm	and posted in Give-away. You can follow any responses to this entry through the RSS 2.0 feed. « You’ve Made My Day! heck yeah!!! enter me!!! !I love the MAX man…sounds like I know him, huh??? I don’t, my favorite of all time is “The Great House of God…” I’ve read it over and over…made me look at the Lord’s Prayer in an amazing way….oh well girlfriend…I’ll be back later!!! and I’ll post about it…. (give me a little time…gotta run the girls to dance!! ):):):):):):):)love you!! How fun. I don’t believe I have read any of these books. I have read some of Max Lucado’s books though and I have enjoyed them.Smiles! Hi, Angie! Thanks for letting me in on the awesome giveaway. I actually really like Max Lucado, but don’t have any of these books, & I have not gotten to read them, so I would really love to win! thank you, angie, for the invite. i’d love to join and win these books. I am a fan of Max as well and can’t believe that I have not read these three books yet. It must mean I am meant to win! :o)Thank you for the generous giveaway. Found you via Kim at Season’s of My Heart. I’d love to join in the giveaway.Have a blessed day! Oh I have read a few of his books but not these three. Please enter me in your give away. Thanks and God bless. Finally I can say – “Enter me pretty Pleast”…I posted a link from my blog this morning 🙂I always enjoy Max Lucado’s writings. He always shares His Word in a form that even gets through to me.Blessings on your Tuesday, my sweet friend. I have seen his books but never read them. Please enter me. Sounds interesting, love to read. Thanks. I would LOVE to win these books! I’ve never read them before. I have several of his children’s books and our family LOVES them!Pick me! One of the first books I ever read as a brand new Christian was one of his. He is a very gifted author.Thank you for entering me in your giveaway! I just posted a passage from No Wonder They Call Him a Saviour on my blog then found your blog from Sting My Heart! How neat. I would love to win a book. He’s such an awesome author. I’ve never read any of his books. I’d like a chance to read them. I’d love to be entered also. I’ll have the post up in the morning! What a gracious host you are! May God multiply the seeds you are sewing into His kingdom. Thank-you! Hey Angie, Please sign me up! 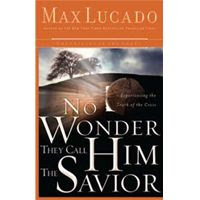 Jennifer C.
I agree, Max Lucado is a wonderful author and I would be so blessed to win his books. So please sign me up! I love Max Lucado’s books. I’ve actually read <><>Six Hours One Friday<><> but would be happy to pass that one to someone else in order to enjoy the other two that I haven’t read!Thanks for your generous giveaway and the opportunity to win these great books! I have been reading his books for a long time now…… soooooo yes please enter my name….. Please consider me for your giveaway. What thoughtfulness! Our women’s fellowship just completed ‘Cure for the Common Life’ study. Your offer is certainly not ‘common’, nor Lucado ‘common’ reading. Bless you. Please enter me! I love reading books written by Max Lucado. They are just so easy to read and so real. Seems like they always tell me just what I need to hear. I love Max Lucado. Sign me up!